In early June of 1989 I had made my way through China to Guangzhou in southern China near the mouth of the Pearl River and only a day's worth of travel from Hong Kong. The weather was humid and hot and it rained daily, a first glimpse of the tropical summer heat that descends on southern China every year. I was thinking of this as the end of my trip through China - I had already spent way more time in the country than I had ever imagined and it was time to move on to either Japan or the US if I ever wanted to make it around the globe. China had been much more interesting and complex and much, much larger than anticipated, but it was time to move on. My original plan at this point was to exit from here to Hong Kong via boat or train, but I had the luxury of a wide-open backpacking schedule and over the last two months I had met many other travelers in China, some of whom were now again staying in the same hostel. We were all exchanging travel plans and home addresses and on the spur of the moment I teamed up with another German backpacker, Hiltrud, who had been planning to go Hainan island. It was very easy for Hiltrud to convince me to come along. Hainan is a large Chinese island in the South China Sea, not much smaller than Taiwan and along its western shore generally less than two hundred kilometers from the Vietnamese coast. It sounded like a tropical paradise, untouched by tourism, with empty beaches - a perfect break from the urban, gritty reality of China's cities. So I found myself on June 4th very early in the morning on a rickety - and very overcrowded - boat that would take us over the next 30 hours down the Pearl River and across the sea to Haikou, the main city at the northern tip of Hainan. It was a grey day with low clouds and frequent rain and the ship was jostled around by heavy seas once we left the river delta. I don't remember much about this day other than spending much time in my bunk reading and sleeping, just hoping for a few nice days on the island. Haikou was a bit of a disappointment, a rough industrial harbor town that offered little for tourists at the time and only gave a very vague glimpse of how beautiful this island could be. There were construction sites everywhere and the streets were dusty and crowded with trucks. We immediately decided to move on to southern Hainan by overnight bus and spent most of our short stay in Haikou eating and snoozing under a tree in a small park. We were on a bus by four o'clock in the afternoon on June the 5th, never having read a newspaper or listened to a short wave radio during the day. That was a crucial point, as we should discover shortly. The bus ride lasted late into the night, a dreamlike never-ending dodge through dark villages along country roads populated by buses and trucks that mostly were driving without their headlights, only vaguely illuminated by the moon. We had two hair-raising encounters, one with an oncoming bus that was overtaking a truck while we were ourselves overtaking a slow-moving tractor, and at one point we encountered a huge pile of gravel in the middle of the road that our bus driver only saw at the very last second in the dim moonlight. On the bus were several other backpackers - one Swiss, one Yugoslavian, a young Japanese couple, another German girl, and since we were all using the "Blue Book" - in 1989 there really was no other guide book for backpackers in China other than the Lonely Planet - we were all planning to stay at the same hotel on Dadonghai beach near Sanya, only a few kilometers from the southern tip of Hainan. The "How to get there" section rather hilariously instructed us to "look for a large tree growing in the middle of the main road and tell the driver to stop." The bus arrived late in the evening - yes, there really was a large tree - and we all trudged to the hotel, checked in and went to bed exhausted. It had been 72 hours since any of us had any contact with the rest of the world. The guest house we were staying at was a very basic outfit, with several small bamboo bungalows clustered in a palm-tree shaded garden along a low-slung one-story concrete building that had a row of rooms with bunk beds, adjoined by the small lobby and a dining room with a very basic menu mostly consisting of fried rice with egg. The hotel was directly next to the beach and one could hear the surf rumbling against the steep sandy dunes from the bungalows. A short walk along a dirt path brought you back to the main street of Dadonghai where several small buildings made of corrugated sheet metal and bare concrete had become small cafes and convenience stores to cater to the few tourists who made it down here. Many of these businesses were obviously very new and had been started on shoestring budgets by local families. There had only been a trickle of foreigners - all backpackers - at Dadonghai beach and so only a few of the cafes had the Rosetta Stone of international dining: A bilingual Chinese/English menu handwritten by a kind traveler that contained all the usual staples for a backpacking hangout, from banana pancakes and french toast to fried rice with eggs and various vegetables. There was almost no English spoken anywhere in town, but most of us had picked up some rudimentary Chinese in the past months and the menus allowed for smooth transactions in the cafes. The number of backpackers in China at the time was still very small and one effect of everybody using the same guide book with limited accommodation options was that one met the same people over and over wherever one went. In this small beach hotel literally at the very southern end of China I ran into two Germans I had already met twice before who had actually biked across most of the country, and who also knew Hiltrud from somewhere else in China. The first day on the beach went by very quickly, with a leisurely breakfast of banana pancakes at one of the small street-side cafe followed by a long nap on the beautiful and empty beach and a quick dip in the South China Sea. The water was warm and the surf was easy for swimming. This was exactly what I had been hoping for. Paradise! Coming back to the hotel, I decided to see what was going on in the world. I happened to have a small short wave radio on this trip and I had made a habit out of checking the news on VOA or the BBC every now and then. And so in late afternoon of June 6th 1989 I had gone back to the little bamboo bungalow I was sharing with Jaques, the Swiss backpacker, and tuned into the BBC for some entertainment. As my little radio picked up the BBC they seemed to be in the middle of a some rather exciting news development. "...and as there are more reports appearing about mass executions and arrests in many Chinese cities, the UK embassy is calling on all British citizens to leave the country immediately.. "
"...we have reports from Xi'an, Chengdu and Wuhan of violent street protests..."
"...other embassies have also called on their citizens to evacuate..."
I had looked up in horror at Jaques, who gave me a similar wide-eyed stare. We had just spent three days traveling to a very remote spot in a country that had in the meantime descended into the throes of a civil war. We walked out into the garden and quickly found some of the other travelers to discuss the developments on the mainland. It was news to all of them and it didn't take long to come up with a very short list of options. One, we could try and take the bus back north and attempt to get a boat from Haikou back to mainland China or Hong Kong, but Haikou was the main city on the island and if there was any trouble on Hainan it would be most likely there. Or, option two, we could check when the next boat went from Sanya directly to Hong Kong. This was by far easier and would actually get us out of the country immediately. An easy choice. Somebody had a schedule for the boats and the next boat would be in a few days, so it looked like a good idea to organize tickets now. By the next morning all travelers that currently were staying in the hotel had heard the news and we packed into two little three-wheeled taxis and sped down the road towards downtown Sanya and the local CITS office. The news was not good. The boat had only one scheduled run a week, the next one being a few days out, but the CITS staff made it clear to us that the next boat may be delayed due to an incoming Typhoon that was plowing through the sea around Manila right now and could veer north into the South China Sea over the next few days. We all bought tickets on the next trip out and went back to our hotel. Things were tense. Most of that afternoon was spent huddled around the short wave radio, listening with growing horror to the reports of tanks on Tiananmen Square, executions, pitched street battles between students and soldiers in various cities across the country. There was indeed one report mentioning trouble in Haikou. It was quiet and peaceful here on the beach, but we couldn't stop thinking about what was happening on the mainland. And what could we do? We'd have to wait for the next boat, no matter what. The next morning brought more bad news from the rest of China. All embassies were actively evacuating foreigners all across the country with announcements on short wave stations to gather at the airports of larger cities like Xi'an and Chengdu for specially chartered flights to Hong Kong. Nothing we would be able to take advantage of. Otherwise life on the beach was as close to paradise as could be imagined. The food at the little road side restaurants was extremely cheap and tasty and the beach was a stretch of several kilometers of white sand with barely another person in sight. The water was warm and the surf was calm. It was strange to sit on the beach with the news in mind, but there was literally nothing else to do. Most of the next day - the 9th of June - I spent in the lobby of the hotel as I had been ramping up efforts to call my parents back in Germany. Phone connections out of Sanya were probably bad on a good day, but with the political upheaval in China it seemed to be near impossible to get a stable line out of the country. It took hours for the hotel staff to get the connection for me, only to have it descend into white noise and crackling chaos within seconds. In the evening of that day our hotel staff came over and told us to get out of the beautiful and airy bamboo bungalows and to move into the concrete building, since the storm was coming. What storm? We had completely forgotten about the Typhoonand at this time the sky was clear and at sunset the horizon exploded in shades of purple. There was not even a slight breeze to cool the air. We ignored the warning and went back to listening to the news. The next morning was humid and overcast, but there was very little wind and it looked like if it would clear up it could be another beautiful day. A false promise, as the sky rapidly became darker during breakfast and the air suddenly smelled of ozone. Now there was gusty wind shaking the palm trees, and after a few minutes of rapidly deteriorating weather we all gathered our backpacks and dragged them over to the concrete dormitory. By nine o'clock in the morning the sky turned black and the wind went from gusty to howling storm strength. It was astonishing how fast the weather had turned and it became apparent that the Typhoonwas about to get close to the island. Much closer than anybody, including the locals, had anticipated. By ten o'clock it was nearly as dark outside as it would have been at night and the power went out as the storm gathered strength. The Typhoondelivered a direct hit to Hainan island and the chaos and civil war on the mainland was forgotten as we all stared in shock out from the dining room of the hotel as in the garden the palm trees were uprooted and literally took flight. There were no lights anywhere in the small beach community and it was pitch black outside with shrieking wind and horizontal rain. Unidentified chunks of buildings and landscaping flew past, occasionally banging into the thankfully very sturdy building we had fled to. The South China Sea - so very welcoming and glassy only the day before - was a thundering, furious presence only a sand dune away from the hotel and the sound of the waves had turned into the roar of a never-ending freight train that literally shook the building. The eye of the Typhoonpassed during that day, but the extreme wind conditions lasted all afternoon and into the evening and the sky grew only a little bit brighter before night set in, leaving us in complete and utter darkness. The staff of the hotel made several attempts to get the hotel's generator to work, but every time the power cut out again after a few minutes, leaving us to rely on candles and flashlights. Just before the power had gone out somebody had been playing a Tracy Chapman bootleg cassette on the stereo in the dining room. Whenever the emergency generator came on, the tape slowly spun up for a few minutes, with Tracy Chapman's sad voice echoing off the bare concrete walls of the hotel dining room - "Talking 'bout a revolution..." - only to be replaced again by darkness and the howling of the storm outside. The next morning the winds had died down and patchy clouds dotted the blue sky, the air was pleasantly cool. But the tropical paradise around us had been transformed into a disaster zone with uprooted trees, partially destroyed buildings and still no power or telephone. Two of the bamboo huts in the garden of the hotel were severely damaged and two were completely gone - they literally must have taken flight. For the rest of our time at Dadonghai we'd be staying in the bare little rooms in the concrete building. We had bottled drinks in the hotel restaurant and whatever crackers and cookies we had in our backpacks. The stores and restaurants along the street where closed or in heavy cleanup mode and since there was no power there was nothing they could prepare for us anyway. 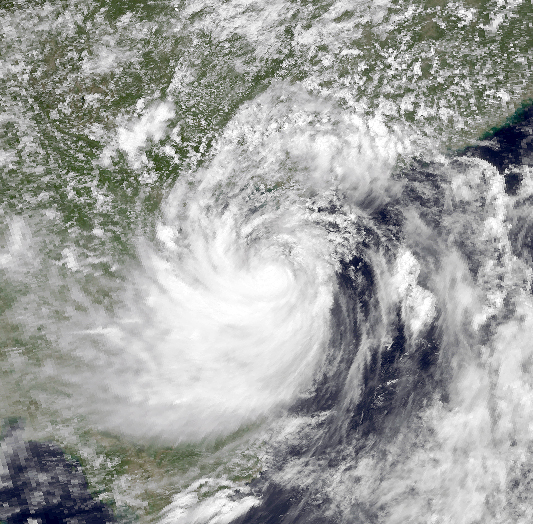 At the time there was no way to get any information about the impact of theTyphoon, but nowadays it is easy to check online: Six people died in the area around Sanya that day and more than 1500 houses were destroyed by Typhoon"Dot" in southern Hainan. The center of the massive storm had passed exactly over Dadonghai beach. We, the few backpackers directly in the path of a major tropical storm that day, had been very lucky. That evening the power came back and by the next morning we were able to again go out to the Main Street for some food at the restaurants, although with a very limited menu for a little while. This left us healthy, fed, and stuck in a country that had just undergone a major political upheaval with violent fights in many major cities. We had not seen any direct evidence of the dramatic events in the rest of China until two days after the Typhoon, when while we were sitting at the usual street-side cafe for breakfast, a row of police vehicles drove past with an open flatbed truck in their midst. On the back of the truck stood several young men with their arms tied behind their backs and a number of soldiers with their rifles in hand. I was looking after the truck with a puzzled expression on my face which was quickly removed when I turned back to Peter, the Yugoslavian backpacker - 20 years older than me and having seen many of the trouble spots of the world - and all he did was to draw an index finger across his throat with a sad smile on his face. At this point all of us would have much rather been somewhere else, but we had not even received word yet when there would be another boat leaving Hainan island at all. We all held tickets for the next boat out, but for now we had to while away long, quiet days in a beach resort, which sounds easy enough, but since the Typhoonthe food options had been limited and we had all run out of reading material and patience a long time ago. My little short wave radio was literally our only connection to the outside world and it went daily from hand to hand for a few hours of listening time. One special memory of these slow days is of going swimming late at night. The weather had become humid and heavy in the days after the storm and it became increasingly harder to fall asleep at night. The concrete building had no air conditioning and the windows were tiny - the airy bamboo huts were missed dearly. So some of us had started to go swimming late at night in the dark. The ocean was calm, the water as warm as in a bathtub. The air was incredibly clear and I have fond memories of floating in the warm, dark ocean on my back, looking up at the Milky Way arcing across the night sky. Looking down, every movement caused microorganisms in the water to fluoresce, creating long swaths of glowing water behind us, mirroring the Milky Way above. It would take four more days before we finally got word from the hotel staff that the next day there would indeed be a boat from Hong Kong, to return on the same day. We all started packing in a rather festive mood. The next day in the morning we commandeered a fleet of the three-wheeled taxis to take us with our luggage down to the harbor in Sanya. The customs procedure to leave the country was very brief and mostly punctuated by the extreme surprise of the local officials who clearly had not been expecting to process any exiting foreigners that morning. We all had a similar mental image of the small rickety boats that had taken us to Haikou, which might explain our astonishment at the size of the ship that had come to bring us to Hong Kong. Apparently the Hong Kong - Sanya tourism trade was expected to undergo a rapid expansion in the near future, as this relatively sleek ship had a capacity of over four hundred passengers. There were ten of us on the gangway that day. We would arrive in Hong Kong a full fourteen days after the Tian An Men massacre, to the general astonishment of the other backpackers in the hostel in Kowloon where we all ended up staying. We had been caught between two storms, and survived both unscathed. We were the lucky ones.